If you’re on the hunt for new wireless headphones, you’ve definitely got to check out the brand new VAVA MOOV 25 Bluetooth Earphones. 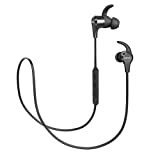 They’re an upgraded version of the most popular Bluetooth earbuds we covered in 2017, having been ordered by thousands and thousands of our readers. The new model is an upgrade in every way, with better sound, better battery life, and a new design that looks terrific. They also have two things that are missing from Apple’s AirPods: a cord to keep you from losing them, and silicone tips so they actually stay seated properly in your ears whether you’re lounging around or in the middle of the hardest workout of your life. They’re a steal at $40, but you can pick up a pair for just $26 if you use the coupon code CARB5CTZ at checkout.